We’d like to thank our friends all over the world for spending time with us on Muscle Car Of The Week in this, our 250th episode! We appreciate the support and look forward to bringing you more awesome Muscle Cars from The Brothers Collection each week! THANKS! It’s amazing to see a beautiful 1968 Shelby Cobra Jet GT500 KR with so few miles on the odometer. Join us as we visit this pristine 428 Cobra Jet powered KR that’s been driven a mere 6806 miles since new… that’s only enough for 2 oil changes! It’s definitely a standout in The Brothers Collection. We had a hard time determining what was cooler about Dave and Kelly Molnar’s 1969.5 Dodge Super Bee, the A12 440 Six-Pack driveline, the quality of the restoration, or the story of the car itself! Follow along as Dave brings us up to speed on this rare Mopar and the amazing story of how it came to be a feature at the 2017 Muscle Car and Corvette Nationals - twice! Once in the unrestored “Barn Find” section, and then again as a fully renewed supercar ready to hit the streets again! MCACN Coverage brought to you by The Brothers Collection. This 1970 Dodge Challenger R/T SE has so many cool things going for it that it’s hard to know where to start. At first glance, the original appearance is a testament to the car’s history of being driven, which is unusual for a real 426 Hemi car today. The gator pattern vinyl top is a rare factory option, adding a bit of elegance to the bad-in-black brawler appearance. It’s almost like a bouncer at a fancy club… big and powerful, but with style to match. But perhaps the coolest aspect of this all-original Super Track Pack 4-Speed 1970 Hemi Challenger is the fact that it remains in its original family, bought new by our interviewee Gregory Qualls’ father back in 1969. It’s a wild car with a great story and a bright future, as seen at the premiere Muscle Car show, the Muscle Car and Corvette Nationals. 1971 Plymouth hemicuda convertible. The top dog… er, fish, of the Muscle Car world. 425 horsepower, 490 pound-feet of torque, 100% superbad. 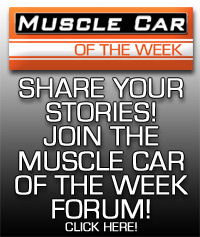 We take this one for a spin on this episode of Muscle Car Of The Week! From The Brothers Collection. In aviation, the term Mach 1 refers to the speed of sound. THIS Mach 1 is the fanciest of the various Mustang packages available for 1969, and it features the brutal 428 Cobra Jet V8 with Ram Air induction, and it’s also quite a ride... from the Brothers Collection. A 1969 Ford Mustang powered by the legendary 428 Cobra Jet V8 with a functional shaker Ram Air hood.